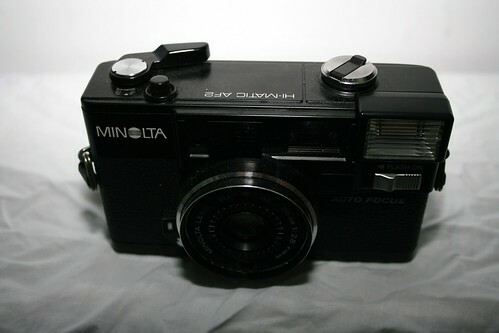 Maybe the Minolta Hi-Matic AF2 was the first viewfinder camera for 35mm film with active infrared autofocus when it was launched in 1981 as successor of the Hi-Matic AF. It was one of the last of Minolta's long-lasting Hi-Matic series of quality viewfinder and rangefinder cameras with automatic exposure. In addition to its autofocus the camera has a buzzer which indicates too small object distance or low light. The built-in flash needs two AA-batteries. The camera has the same kind of lens as most other 1970s Hi-Matics, a four-element construction with focal length 38mm. It has also the typical CdS-meter window inside the filter-thread in the front of the lens barrel. Even the film speed selector around the lens is typical 1970s Hi-Matic design, as well as film advance lever and rewind knurl. 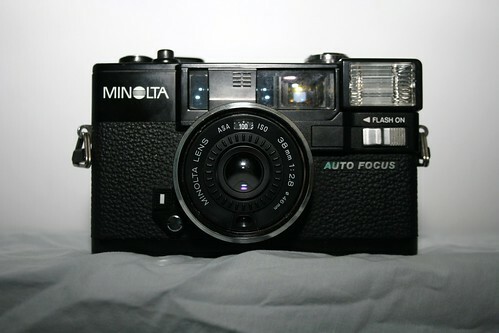 The variant Minolta Hi-Matic AF2-M of 1982 had in addition motorized film transport, thus being the only modern compact camera of the Hi-Matic series. But then 1970s design was definitely out so that the series was discontinued.